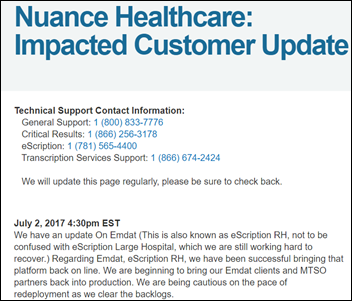 Nuance’s post-malware update says the company is bringing Emdat (aka eScription RH) clients and MTSO partners back online, but eScription Large Hospital remains down. Nuance advises transcription customers that use BeyondText or iChart Hosted Solutions to have their physicians re-dictate their documents going back to 48 hours before the incident that occurred this past Tuesday, June 27. From Judy Fake-ner: “Re: Hoag Health (CA). Will be leaving Allscripts Sunrise to join Providence-St. Joseph Health’s Epic system. Heritage Medical group is also transitioning from Epic to Allscripts.” JF sent over an internal Hoag memo from February 2017 that explained why it’s moving away from Allscripts. From Amphibious Assault: “Re: [company name omitted]. I asked the CEO what publications his team reads. He said that everybody just reads HIStalk.” Thanks. We have that in common, then. One-fourth of poll respondents say they’ve lost an IT job due to a new system’s implementation. Just a Nurse Analyst says she walked away from her job (and her five Epic certifications) after seeing the “creepy” situation in which Epic was directing hospital staffing decisions and pushing the CIO with threats to go to the CEO. Furydelabongo experienced poorly executed layoffs at a previous health system employer that was desperate to find operating dollars to support “an Epic project run amok with consultants” once requesting more capital dollars became distasteful. Greek CIO says he/she was displaced when Eclipsys convinced hospital management to outsource all of IT to the company at a 300 percent increase in staffing cost. New poll to your right or here: For Nuance users: how much business will you give the company following its cloud services outage? My “summer doldrums” special deal on newly booked webinars and sponsorships is winding down after a few companies jumped on board. Contact Lorre. Listening: new from Iowa’s Stone Sour, moving away from their last couple of progressive-type albums to pure alternative metal that invites vigorous, four-limbed desk-drumming (as I can attest). Also: Diablo Blvd, catchy hard rock from Belgium with a singer who – no joke – is a stand-up comedian. Allscripts sues former chief marketing and strategy officer Dan Michelson and his new employer, Strata Decision Technology, claiming that Michelson and the company used confidential information to displace Allscripts as the top-ranked product in KLAS’s “Decision Support – Business” category. McKesson announces that it will spin off its Technology Solutions business into a new company that it will co-own with Change Healthcare. Definitive Healthcare acquires Billian’s HealthData. A study finds that PCs and servers that control hospital medical equipment are often running old versions of operating systems that make them vulnerable to malware attacks. MModal announces that it will be acquired by a private equity firm for $1.1 billion in cash. The Supreme Court upholds the legality of the Affordable Care Act, including its requirement that every American carry medical insurance or pay a fine. In England, Cerner complains to Cambridge University Hospitals Foundation Trust that its EHR bidding process was a sham and that it had already settled on Epic before launching it. The government of Australia admits that the signup function of its just-launched personally controlled record system had to be taken offline when it was found to not support hyphenated patient names, with Accenture getting the blame. Francisco Partners acquires Dairyland Healthcare Solutions. Mediware President and CEO James Burgess announces his resignation. PSS World acquires a 5 percent stake in Athenahealth for $22.5 million. Apple provides developer information for the just-released iPhone. 50 hours, six days per month on the road. I’m a woman who just hit child-rearing years, so now I’m down from 75 percent max to just above 0 percent. I like having a husband! Work hours should be held around 50. As for travel maximum, it should be 1 1/2 weeks per month. 45 hours and 10 percent travel. 40-45 hours per week and 20 percent travel. Work hours including time in the air? Does this include the number of days that require me to leave my family on a Sunday afternoon? Work hours range from 50-75 depending on where I am traveling. I typically travel 50-60 percent of the days during a month. 9-5, work from home option. 10 percent travel requirements. After years of 80 hours per week and 75 percent travel, I’ve found balance and what’s important in my life. At this point, I wouldn’t do more than 50 hours per week and 25 percent travel. 45 hours of work, per week. 10-15 percent travel (1x/month ish). 40-45, one week up to a couple times a year. In my line of work (consulting), job opening are pretty thin right now so my expectations have changed a bit. I would hope to limit travel to three days a week, and a corporate mindset that if travel isn’t necessary to move the project forward, we don’t travel. I’d hope to find a culture where weekend hours are not the norm. About 45 hours per week. Special projects may require more occasionally, but if you need me more than that, then you have an issue with resource allocation. For a position which requires travel, every hour, from the arrival at the originating airport to the destination, should be counted as a work hour, especially since I am expected to be on calls or work while in transit. So, roughly the same hours, with some exceptions. And if traveling on a weekend or holiday—comp time. Don’t recall going at it with that focus in mind. However, now that I’m away from the the travel jobs and requirements, I can share that, yes, it’s typically the case that you arrive at client’s site around 7:30-8:00 a.m., usually work through “breaks” and lunch so you can “answer client questions,” you leave around 5:30-6:00 p.m. (maybe later if you need to meet with the doctors after their workday is done). After grabbing some dinner back at the hotel, you go back to your room and start making edits to a template, writing up a report, answering emails, etc. and finally call it a day around midnight. And that is just the M-F schedule, not the catch-up on the weekend. If I added up all the hours, I’m guessing I earned $2.75/hour! I don’t honestly know how I would have limited the weekly work hours and travels requirements and still kept my job. Can’t say I miss it! Not that part anyway! 50 percent, less than 10 nights out per month. 60 hours per week, no more than 75 percent travel. Realistic expectation based on 25+ years in travel roles: M-F belongs to your work life. You’ll work as many hours as needed for whatever phase of the project, and travel however many hours are required to get to/from the client site(s) for the week of work. If you are lucky there will be slow-ish weeks where you can get out in the evening and sample the local culture. Be sure to protect your weekends/holidays else the lines will start to blur and you’ll find that your work IS your life. 70 hours. What a blessing that would be after working conference meetings while carrying on numerous marketing functions, launching new campaigns, presenting annual budgets with their justification, training sales, producing new materials, securing new clients, and creating new products. During my 25+ years in the healthcare business, I’ve slept possibly three hours a night, missed my child growing up, and have lost more relationships than I can count – never mind the issues this took upon my health. I’m happy to travel at any level and take certain conference calls while on the road. However, when I am on the road and taking two conference calls in each ear while being asked to speak with a prospect or answer sales questions is unreasonable. I travel typically during the evening on my own time. However with time changes, conventions, conferences, prospect and customer meetings, as well as bosses’ schedules, the calls tend to eat up valuable face time with clients and prospects. Working from 5:00 a.m. to 2:00 a.m. simply to meet expectations is unreasonable, then add the travel to that schedule is not an acceptable demand. I don’t mind working a 70 hour week, but 126 hours a week is a two-person job. 70 hours per week, excluding evening travel, seems much more reasonable than 126. A limit of 200 work hours per month and 15 days of travel, with the hours spent in transit counting against the work hours limit. If either limit is exceeded, travel in business or first class would be required. Expense limits on hotels, meals, and incidental expenses need to be realistic for the locations visited. Particularly in light of the efficiencies of teleconferencing , my limits would be no more than 50 hours weekly and 10 days of travel per month. Average should be 40 hours with seven or less days of travel. 50 hours per week and travel only seven days out of the month. This week’s question: for those who are allowed to work from home for at least one day per week, what restrictions or requirements does your employer impose? It would probably be informative to describe (in high-level terms) what your job involves since it’s likely to be a lot different for a software developer than an implementation consultant. An apparent ransomware attack takes some of Nuance’s cloud-based services offline. CMS cancels its scheduled release of Medicare Advantage data to researchers at the last minute, citing data quality concerns. The chairs of the Senate Veterans Affairs and Armed Services committees urge the VA to seek the DoD’s advice in its Cerner contract negotiation and implementation. Google offers consumers the ability to request that their exposed medical information be filtered from its search results. Anthem agrees to pay $115 million to settle a class action lawsuit involving its 2016 hacker breach of 78 million records. Wisconsin’s Department of Health chooses Cerner for its seven care and treatment centers in a 10-year, $33 million contract. In-state competitor Epic did not submit a proposal for the project, which drew five bidders. Cedar County Memorial Hospital (MO) will replace NextGen Healthcare with Meditech in 2018. Rankin County Hospital District (TX) will go live on Cerner by November 2017. Christus Mother Frances Hospital – Sulphur Springs (TX) will replace Meditech with Epic in October 2017. 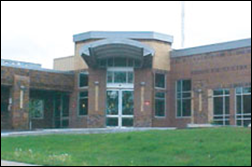 Teton Valley Hospital (ID) will move from Healthland to Athenahealth in September 2017. Liberty – Dayton Community Hospital (TX) will go live on Cerner in March 2018. Sandy Rosenbaum, SVP of contracts at Iatric Systems, died June 21, 2017. The Alzheimer’s Association fundraiser launched in her honor by her husband — Iatric founder and CEO Joel Berman — has raised $223,000 vs. his goal of $10,000. The family of former Sutter health CIO John Hummel launches a fundraiser looking for help covering his rehabilitation costs following a fall-related head injury that has depleted his insurance benefits and personal funds. His LinkedIn profile says he’s now director of IS at Taos Health System (NM). 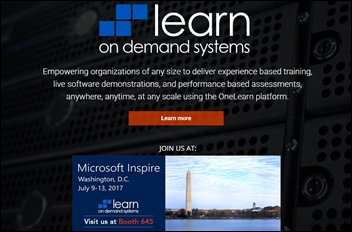 Learn on Demand Systems adds an API-accessible instant notification engine to its training management and lab-on-demand learning systems, allowing instructors to send tips to particular students or to send commands that the student can play back in their lab console. 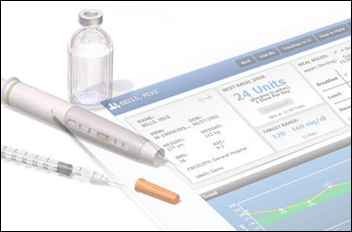 The patent office issues five new patent allowances to Glytec for its diabetes therapy management software, raising the company’s allowed/issued patent total for EGlycemic Management System to 11, with another 50 pending. 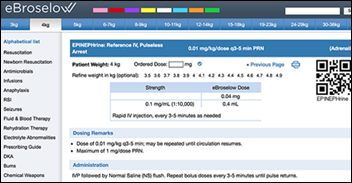 T-System integrates EBroselow’s SafeDose and SafeDose Scan medication calculations functionality into its T-System EV EDIS. Sphere3 releases Aperum Enterprise, which allows health systems to analyze nurse call light data and patient feedback to set patient experience benchmarks. Austin, TX-based VA officials warn that the department’s $543 million real-time location (RTLS) system is in danger of “catastrophic failure” as the overdue system has failed operational tests and may not work on the the VA’s WiFi network. The VA pitched the system as the solution for managing inventory and ensuring equipment sterilization, but a DC hospital site visit found that the lack of a functional system has caused supply crises that have required cancelling surgeries and using expired surgical equipment. 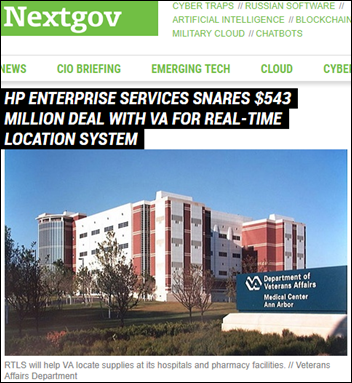 A VA employee’s email referred to the former HP Enterprise Services (now DXC Technology) as “nitwits” and refused to give the company access to its backup systems, while the company blamed VA incompetence. The company’s RTLS subcontractor is Intelligent InSites. Employees at the same DC medical center are refusing to use Catamaran, a $275 million predictive analytics supply chain system whose contract has since been terminated. 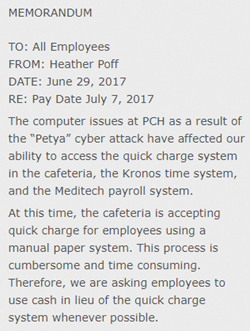 Princeton Community Hospital (WV) remains down as its IT department continues to “build an entirely new computer network and install new hard drives on all devices throughout the system” following last Tuesday’s ransomware attack. The hospital lost access to all systems, email, and the Internet but has since installed 53 new computers to provide access to Meditech. A Connecticut hospital warns local residents that scammers are spoofing its caller ID to demand that they send payment for medical services. A West Virginia community college hosts a week-long Drone Camp for high school students, with funding for the 12 drones provided by Cabell Huntington Hospital (WV) via VP/CIO Dennis Lee, pictured above with the participants. The Boston Globe says consumers are losing patience with waiting room delays caused by intentional provider overbooking to maximize profit. The article observes that many hospitals don’t even monitor delays, possibly because despite alleged consumerism, their waiting rooms remain full. Possible solutions include hiring a patient flow coordinator to monitor delays, giving patients pagers so they aren’t tied to their chair waiting for their name to be called, posting notices on the board when doctors are running late, and tracking patient flow by RTLS. 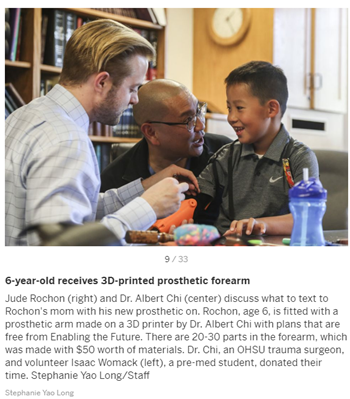 An Oregon trauma surgeon designs and creates a $50 3D-printed hand and forearm for a six-year-old. ZirMed receives HFMA Peer Review Designation for its charge integrity and claims management solutions and also announces that its charge integrity solution has identified $7.5 million in recoverable net revenue for Novant Health. x00 millions of Center for Medicare and Medicaid Innovation award (tax payer’s money) has gone toward financing the development of EHR database schema skimming tools. These tools appear to be a red carpet financed by CMS grants to further Real World Evidence initiatives by pharma majors. Hopefully the current administration with physicians being appointed to key administrative positions will put a stop to this scam. Epic does that. Your privacy office has to set the rules up, but it can be multi-tiered. Person A accessing a patient may trigger an immediate alert to people, Person B accessing the same patient will only log something for monthly review, and Person C has no issue at all (and only normal access is logged). This seems completely inappropriate. Thank you.